It’s been three weeks since the Lutheran Invasion, but there’s still a pile of four-year-old flooded junk in front of the house next door. Don’t blame the Lutherans for this mess. Blame the Preservation Resource Center. Blame Operation Comeback. I was so excited when my neighbor donated his house to this program, so looking forward to some positive activity there. And I do hold out hope that ultimately they will make the situation better, once they get the house renovated and sold to a first-time homebuyer. But in the meantime they’ve actually made our living situation worse. Our houses are so close together this pile is practically on our front steps. It’s moldy and stinky and nasty and gross. It spills into the street, making it difficult to park our car. I’ve had to shovel the pile off the street back on to itself. Some mirrors and panes of glass that were intact have gotten broken. 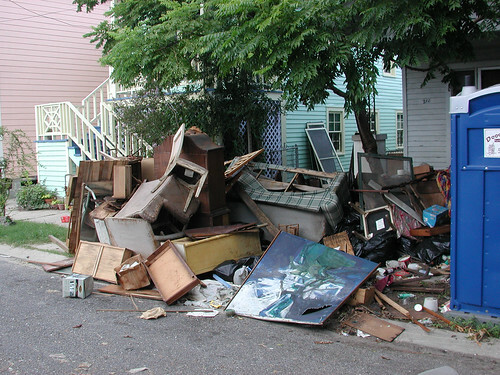 Neighbors have thrown their garbage on top of the pile, somewhat offset by the pilfering of items from the pile. I’m not sure who would want this water-damaged furniture but I believe I saw some pieces end up on a neighbor’s porch. The pile is actually getting smaller. I’ve been in regular communication with the PRC about this problem. They assure me they’re working on it. Not fast enough for me. Update: August 18: The pile of crap was removed , hooray at last. Nothing left but broken glass. Dibs on the broken mirror pieces! it will be hard to sell your place with that pile of crap out front.